As the name suggests, Seascape is a comfortable, modern and stylish coastal home with the most magnificent sea views out along the Amble Pier, the lighthouse and when out on the terrace, out to Coquet Island. On a clear day you can see up the coast to Dunstanburgh Castle and the whole of Alnmouth Bay. 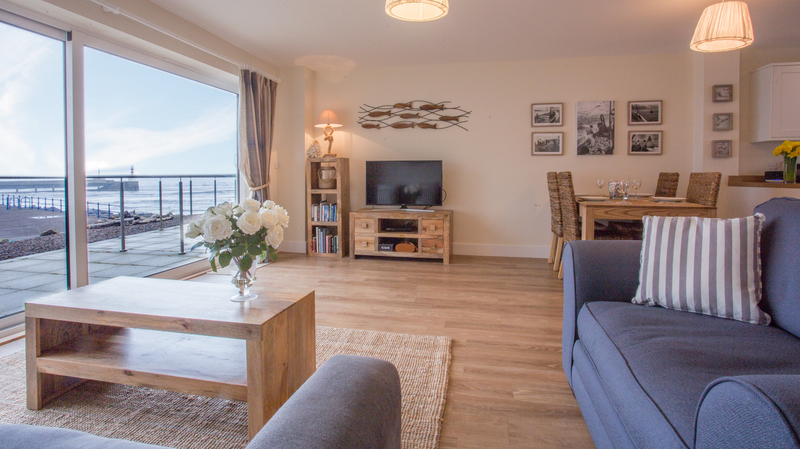 Like its sister property, Bay View, just 2 doors away, this gorgeous coastal holiday home is a great escape to the coastline to watch the ever-changing seascape of the dramatically beautiful North Sea. The next door neighbour to Seascape is currently carrying out building works to their property. For this reason, the rental rates for Seascape have been reduced by up to 40% to reflect the fact that there may be occasional noise disturbance, and you can see some of the works from the front of the property. There is no given time scale of the building work, but in the meantime, Seascape is perfect for those wanting to experience the beautiful Northumberland coast in a luxury property, with gorgeous views on a budget. Click ‘Read More’ below for more details. Seascape sleeps 4 guests in 2 bedrooms. 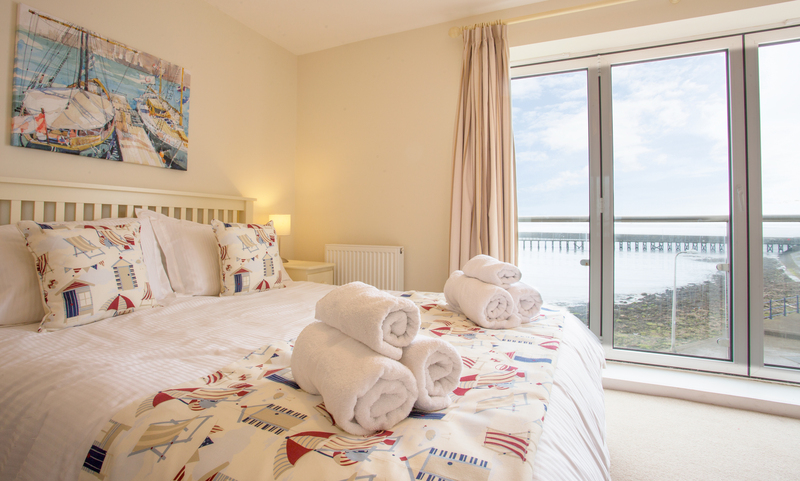 1 king size room with floor to ceiling windows looking out towards the pier and out to sea, and a twin bedroom. There are 2 bathrooms; an en suite shower room to the master bedroom and a family bathroom with a bath and shower over. The open plan living area is perfect for the relaxed coastal position of Seascape and to benefit from the views. The kitchen, dining area and lounge are very comfortable for 4 guests. 2 small-medium size dogs are welcome here and there is free Wi-Fi as standard. The neighbour to the side of Seascape is currently carrying out renovations to their property. The properties aren’t attached, but you can see the works to the left of the view out of the front windows. Whilst this doesn’t disrupt the view at all, as the sea view and pier occupy most of the right side of the view, there is evidence of works to the left, with building materials visible. The renovation is being carried out by the owner himself, so disruption isn’t for long periods of time. There may very occasionally be deliveries to the front of the property, which is public land. For this reason, the owners are offering a much reduced rental rate to reflect the effect of the neighbouring works. This allows couples and families to experience a luxury property in a very enviable position on a much lower budget. The rental rates will increase to the normal market rate as soon as the building works are complete, however if you book at the reduced rate and the works are complete by the time of your holiday, the rate you have paid will be honored. Entrance is to the hallway with a cloakroom and stairs leading to the bedrooms and bathrooms on the first floor. A door leads to the open plan lounge/dining area. The kitchen is open to the living area but is spacious too. 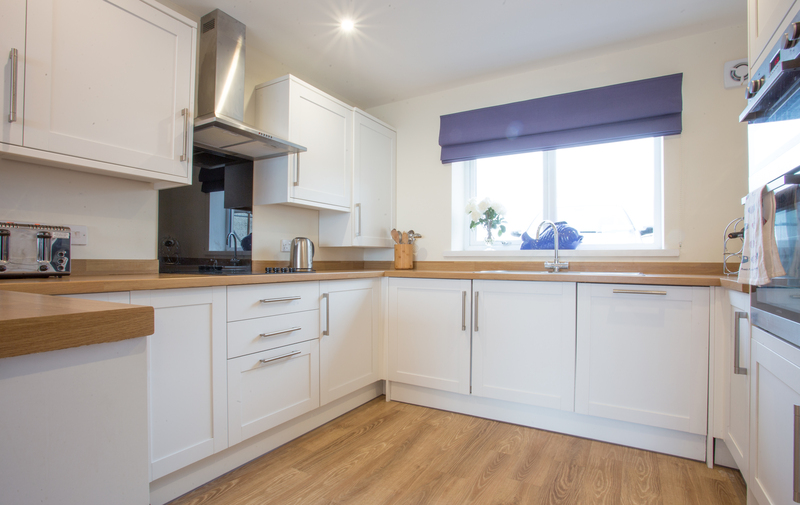 With a large, integrated fridge/freezer, microwave, kettle, toaster, cafetiere, electric oven and grill, ceramic hob and washing machine and the dining table comfortably seats 4 guests. The stylish and calm, coastal-inspired lounge looks out to the patio through the huge sliding doors and onto the lighthouse and Amble pier. The lounge seating is for 4 and there’s a flatscreen TV and DVD player. Free wi-fi is available throughout the cottage. The patio is furnished with a picnic table and looks out to the Amble pier and the lighthouse, with a great vista of the rock pools when the tide is out. An oak staircase leads to the first floor with 2 bedrooms; the master king size room and the twin bedroom. The master bedroom has an en suite shower room and there’s also a spacious family bathroom. A gorgeous room with beautiful views of the sea and coastline. Full length windows open with a glazed Juliette balcony so you can enjoy the fresh sea breeze on a warm day. The bed is king size (5ft wide). A hairdryer is provided. 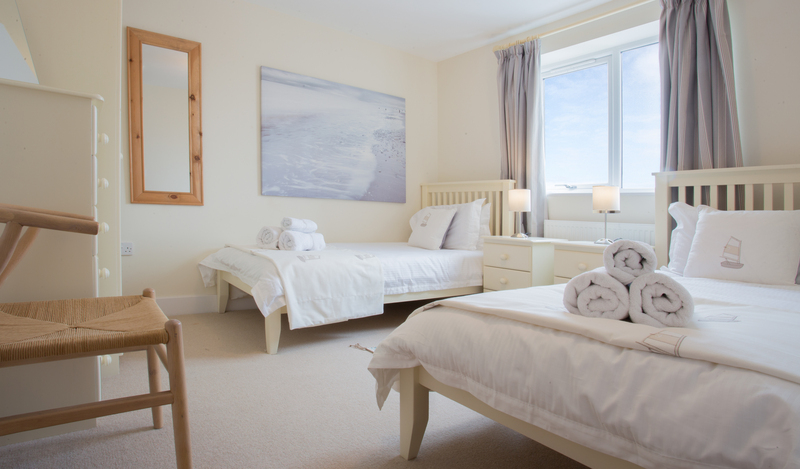 Beautiful soft furnishings in coastal hues help to make this a very special room to relax and enjoy the sea views. 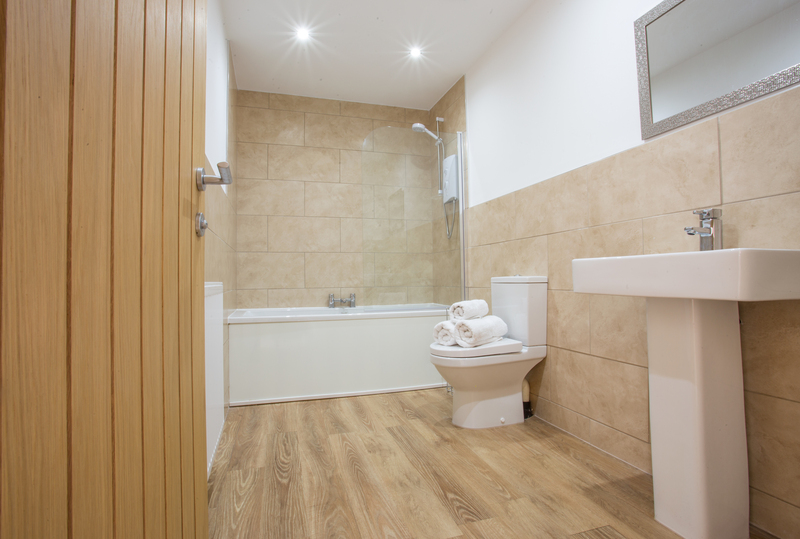 The en suite shower room has a large shower, WC and wash hand basin. Towels and complimentary toiletries are provided. A pretty bedroom with a twin single beds (3ft wide) overlooking the other end of the headland and out to sea which is quite attractive. The soft furnishings are beautiful. Luxury bed linen and fluffy towels are provided, with plenty of storage. A hair dryer is also provided. This bedroom cannot be converted into a super king size. The family bathroom is very spacious with a window letting in plenty of natural light. Bath with shower over, WC, wash hand basin and with plenty of storage. Luxury towels and complimentary toiletries are provided. Seascape is located at the end of the Bay View headland in Amble, overlooking the coast and the Amble pier. It’s within very easy walking distance of the harbour front with its shops, restaurants and famous Spurelli’s ice cream parlour. The terrace is fenced off but not completely private to passers by. There’s a private parking bay for 2 cars adjacent to the front door, and a super new children’s play area is just opposite the cottage, within an attractive open grassed area, ideal for children and dogs. There are lovely coastal walks from the cottage to sandy beaches. Rockpools, the pier and the red and white stripy lighthouse at the end of the harbour walls make the view from Seascape picture-postcard-perfect. This holiday home is charming in every way, in any season. The lounge looks out to the promenade and the sea beyond, with huge sliding windows so you can sit out on the terrace. 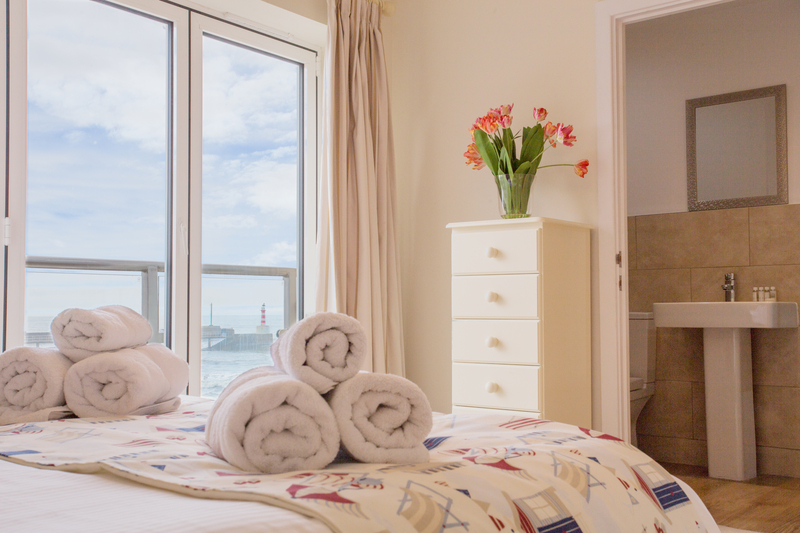 The master bedroom looks out to sea and has a Juliette balcony looking out to the promenade and the rock pools. Even on a stormy day, the outlook is magnificent. Open plan to the whole living area, you can still enjoy the coastal views whilst sitting here, which is very peaceful and glorious first thing in the morning. If the view wasn't enough to remind you how close you are to the sea, the cottage is full of coastal-themed objet-d'art. The spacious kitchen is well-equipped and faces onto the front of the cottage. Everything in Seascape is stylishly themed to tie in with it's coastal proximity. Imagine waking up to these breathtaking views! With 2 full-size single beds in this spacious room, this is ideal for children and adults and looks out to the grassland area at the front of the cottage, and beyond out to sea. This very spacious bathroom serves the twin bedroom. Complimentary White Company toiletries are provided. Up to 4 guests and 1 baby welcome. Welcome Hamper including luxury White Company Toiletries and comprehensive bespoke area and property guide. One baby welcome. Cot, highchair and stair gate available upon request. Two dogs welcome. Booking Conditions apply, see more details on our Dogs page. Dogs are not permitted to be left in the cottage unattended. Dog sitting service available, contact us to request. Fridge/freezer, electric oven and grill, ceramic hob, dishwasher, microwave, toaster and kettle. Washing machine, iron, ironing board and vacuum. Hairdryer, books, music and films. Smart TV in the lounge, with access to Netflix, Freeview and a DVD player, Radio and Music System, free unlimited wi-fi. The terrace is not fully enclosed for dogs or small children. Whilst the windows are cleaned at least weekly, the owners cannot take responsibility for any salt spray from the sea which may interrupt the view. Please read above the full details of the building works next door to Seascape at the moment, hence the price reduction. 2 bedrooms; 1 king size bedroom (5ft wide bed) and 1 twin bedroom with 3ft single beds. One bathroom with a shower over bath, WC and basin. One en suite shower room accessed from the master bedroom, with shower, basin and WC. Paved terrace accessed from the huge sliding doors in the lounge. There is a picnic table and it’s fenced off but not fully enclosed. There is no BBQ at Seascape, but you are more than welcome to bring your own, providing the area is left tidy and the BBQ is disposed of correctly. Private parking for 2 cars adjacent to the front door. Accommodation on 2 floors; lounge/dining area and open plan kitchen on the ground floor as well as a cloakroom. On the first floor; 2 bedrooms, 1 family bathroom and 1 en suite. There will be a virtual tour and floor plan available soon for Seascape. In the meantime, please see the sister property, Bay View, for the identical floor plan. The only difference between the 2 is Seascape doesn’t allow access to the single bedroom, whereas Bay View does. Seascape has a twin bedroom to the rear, instead of a double. Seascape is perfectly positioned to capture the stunning Amble coastline and Coquet Island from nearly every window in the cottage. From your front door, you can take a stroll along the promenade to the harbour village, where you’ll find quirky little independent arty shops, an interesting local market on a Sunday and also The Fish Shack, a daytime bistro. You’ll also find Spurelli’s award-winning ice cream parlour, The Old Boathouse bistro and Sea and Soil bistro. The rockpools are great to explore which are right in front of Seascape, as is the little beach and the pier going right out to the lighthouse where you have beautiful views of Coquet Island. You can explore the location of Seascape on the map below, although please note that the satellite images were taken prior to Seascape being built, but it gives you a good idea of the area. The postcode of the property is NE65 0AZ. Seascape is a wonderful holiday cottage! Immaculate, well equipped and has some really great views. The best welcome basket ever received upon arrival which was tailored to us which was wonderful. The birthday present for our little boy was also a great touch. Go surfing! There is a great, little surf community in Amble, with Northside Surf School offering private and group lessons all year round. Jon is a qualified surf instructor and lifeguard, and is great fun for a family day out. Whether you’re looking for a bit of a laugh in a group session, or to improve your skills in a one-to-one lesson, Jon is highly recommended, and can even take you to the ‘private beach’ on the other side of the harbour! All equipment and wetsuits are provided – so what are you waiting for?! Dine at Jasper’s Bistro, a small, romantic hidden gem just off the main street of Amble. Jasper’s specialises in seafood and steak dishes, and has been ranked competitively at number 1 out of 778 places to eat in Northumberland on Trip Advisor! The food is excellent, and the staff go above and beyond to ensure you enjoy your whole evening or lunch time meal. Show your Coquet Cottages key ring to receive a complimentary bottle of Prosecco with your evening meal, or free round of selected soft drinks with lunch! Just be sure to book to avoid disappointment. Take a stroll around the Sunday Market to see the town bustle in full flow. The traditional market is held around Amble Harbour every Sunday. From Seascape, head out around the pier to blow the cobwebs away, and the market begins at the other end. Don’t miss out the wooden pods in the Harbour Village, where you’ll find local businesses, artists and food huts, with a breath-taking view across the harbour and up the estuary with Warkworth Castle in the distance. My grandfather moved to Amble to work as a stonemason in the 1890s. My father spent his life here 1910-2000 working as a grocer on Queen Street. I left Amble to pursue a career in town planning, but always intended to return to buy somewhere with a sea view when I retired. But didn’t expect to find something as good as this! After early retirement, my wife Christine and I bought the land to build 3 cottages at the end of Bay View, right on the end of the promenade and we’re delighted with the results. Our architect has fully exploited the potential of the location. The outlook across the harbour and out to sea is constantly changing and is quite mesmerising at times. It’s a very relaxing place. We hope you enjoy it as much as we do.